Maximum 7 characters. The labels provided will be numbered consecutively, starting at the specified sequence. Maximum 20 characters, per line. Maximum 2 lines. Scanmark foil label with two lines of custom text (upto 20 characters per line), and consecutive barcode number sequence (code 39). Material self adhesive aluminium foil, with laminated surface. Supplied in rolls of 500 labels. Single colour on silver background. Barcode labels. Scanmark foil. 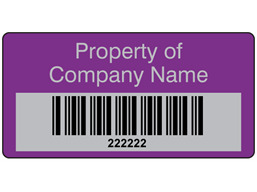 Consecutive serial number barcode with two lines of custom text (upto 20 characters per line). With single colour block print and a black barcode (code 39). Supplied in rolls of 500 labels. BCA11 Size 19mm x 38mm. Material self adhesive aluminium foil, with laminated surface.